A large crack in the surface of the earth, several kilometres long, has caused a highway to collapse in Kenya. The area lies on the East African Rift, where the Arabian and African plate meet. The earth's crust is broken up into several tectonic plates which are constantly on the move, gliding towards or against each other at various speeds. When these plates collide energy is set free, resulting in earthquakes and volcanic eruptions. 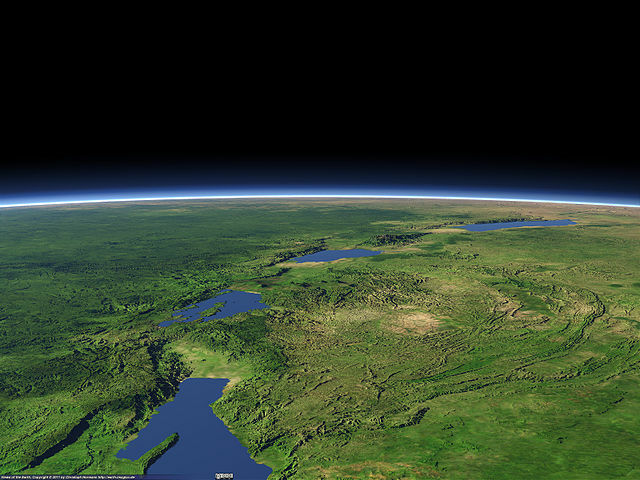 The East African Rift stretches over 3000 km from the Gulf of Aden in the north to Zimbabwe in the south. It consists of several valleys that are filled with long lakes. Because the two plates are moving away from each other Eastern Africa will be separated from the rest of the continent. A rift is the first phase of a plate that is breaking apart. After millions of years, it can lead to the formation of a new ocean. A well-known example is a separation of Africa and South America and the creation of the Atlantic Ocean. Where the earth's plates move away from each other magma plumes come up through the mantle and cause volcanic activity. Forces are so strong that the plate breaks apart and causes major earthquakes. In many cases, plates move slowly, at a rate of only a few cm per year and most of the time we don't notice these movements.